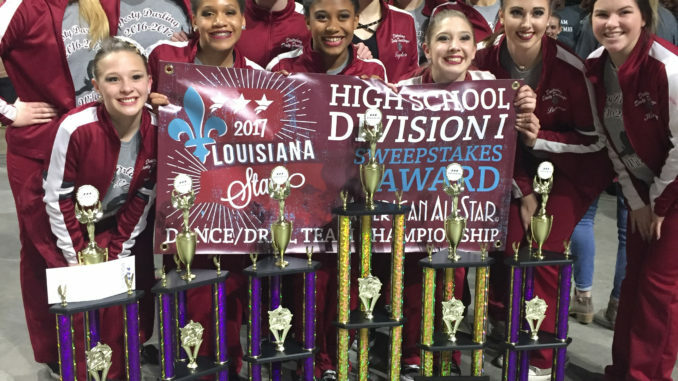 The Destrehan Desty Darlings Dance Team recently attended two Louisiana state competitions. The Destys earned first place for both their jazz and hip hop routines at the 2017 American All-Star Louisiana Dance Team Championship. They received a choreography and technique award for their hip hop number as well. The Destys were awarded the Louisiana Sweepstakes Award for having the highest scores in their division making them the 2017 Louisiana Division 1 High School State Champions. At the UDA Louisiana State Dance Team Competition, these girls placed second overall in the state for jazz and third overall in the state for hip hop. The Destys also received the Crowd Appeal Award. Karley Voges, a Desty freshman, performed her solo and was awarded first place overall at the 2017 UDA Louisiana State Dance Team Competition. Karley also received first place for her solo at the Louisiana State Dance Team Championship and was awarded a scholarship for being the 2017 High School Junior Overall Solo Winner for American All-Star. Kaitlin Mizell, also a Desty Freshman, received third overall for her solo at the 2017 UDA Louisiana State Dance Team Competition. The Destys are currently preparing to compete at the 2017 Universal Dance Association National Dance Team Championship held at ESPN the first weekend of February against some of the most talented and prestigious dance teams in the country. The officers are Captain, Kiley Voges, Co-Captain Layla Ruffin, Lieutenants, Lauren Lanoux and Kyler Thomas. The competitive members are Lexie Babin, Taylor Brown, Taylor Gubert, Danielle Feagley, Hannah Burnam, Karley Voges, Kaitlin Mizell, and Haley Naquin. The Desty Darlings are under the direction of Micque Voges and Assistant Director, Hailee Weber.